This is a good time to be living in Pinellas County if you’re a craft beer drinker. Recent studies place Florida as the #2 state in the union in terms of microbrewery growth, with Pinellas, the state’s most densely populated county, leading the trend. “People like the idea of a grassroots brewery in the same manner that they worry about where their food comes from.” That’s William Quinones’ take on the whole thing. He tends bar in the tasting room at the Dunedin Brewery, touted as Florida’s oldest operating microbrewery, and thinks that people are starting to shy away from big name brewing the same way they’re shying away from big name food producers. At the Dunedin Brewery, patrons drink beer that’s brewed in the very room they’re sitting in, surrounded by massive fermenters and often in the company of live music. Across Alternate-19 at 7venth Sun Brewery, the mood is comparably mellow. Whereas Dunedin Brewery focuses on crafting popular favorites and alcoholic mainstays, 7venth Sun produces mainly specialty or experimental brews, including, but not confined to, sour beers and IPAs. They’ve been open for 4 years and have since gained quite the local following. They’re a short walk from Dunedin Brewery, so you’ll likely see the same folks enjoying drinks at both establishments indiscriminately. Going north along Alternate-19 will bring you to Palm Harbor, where some relative newcomers to the world of microbrewing are making waves. Stilthouse Brewing has been open for less than two years and is already one of the most popular drinking destinations in Palm Harbor. Shaun Greelich is one of three co-owners at Stilt House. I found him somewhere between lounging and brewing in the hangar-like space behind his tasting room which houses several large fermenters, together capable of producing 216 barrels of beer monthly. The origins of Stilthouse can be found in Greelich’s garage, where he would often invite friends to drink beers he brewed as a hobbyist, much to their delight. When asked about the dichotomy of craft vs. macro brews, Greelich recalls a personal event which had a great impact on him: the last time he ever drank a Budweiser, he examined the empty bottle upon his final gulp to find the corpse of a two-and-a-half inch cockroach at the bottom. After some correspondence with Budweiser, the company confirmed that the cockroach had died inside the bottle and offered a refund worth approximately one 24-pack of Budweiser, decorated with the recommendation that he spend the refund on such. Barely a stone’s throw away from Stilthouse is de Bine Brewing Co., a shining monolith of beer who’s open-air brewing space can be seen directly from the road. de Bine is a very recent addition to Palm Harbor, an infant brewery at six months old. de Bine, its name a reference to the vine on which hops grow, resides in a renovated former golf cart repair shop and presents ample bait for beer loving cyclists passing by on the Pinellas Trail. Co-owner Vince Megale came to Palm Harbor from Ocala to open de Bine in the midst of a craft beer market which some might call saturated. 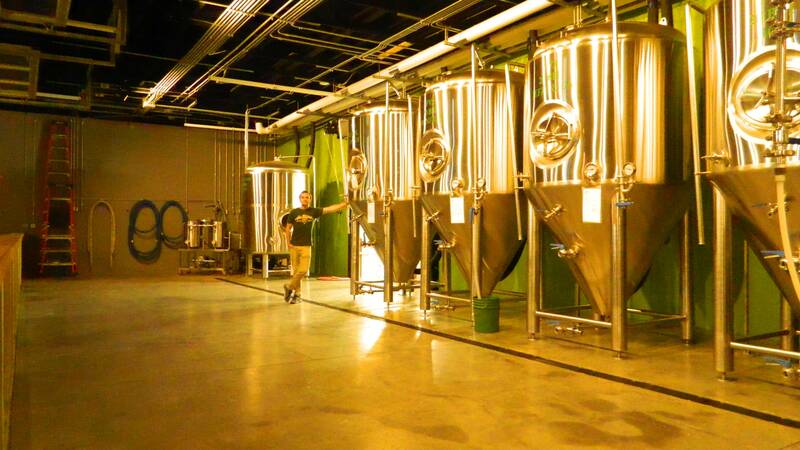 Megale expects a “hyper-local” form of beer consumption in the future in which higher numbers of small, compact breweries replace the comparatively larger businesses like Dunedin Brewery, St. Petersburg’s Greenbench Brewery, and perhaps his own de Bine Brewing Co. When I ask if this might equate to local beer cutting into the consumer base of companies like AB Inbev who produce and distribute macrobrew beer, he doesn’t rule it out; currently, only 15% of global beer consumption is supplied by microbreweries, leaving that remaining market ripe for the taking if only it can be wrestled from the hands of multinational corporations with millions of dollars invested in marketing. In the mean time, the guys at Stilthouse and de Bine are concentrating on making beer, and making it well.